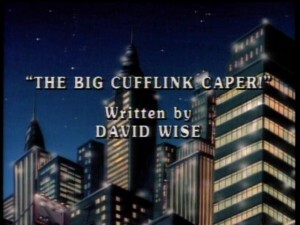 The Turtles, bored at the lack of action, decide to investigate when they hear that cufflinks are being stolen around the city. The lads find out that some of Big Louie’s gang are responsible for it. The TMNT decide to dress up as hoods to see if they can find out from Big Louie what’s going on. Big Louie falls for the Turtles’ ruse and tells them that the reason they are stealing all the cufflinks is that they are looking for the Cufflinks of Cathay. A “certain someone” is willing to pay lots of money for it. The Turtles don’t know it yet, but Shredder is the “certain someone” who wants the cufflinks. Apparently an ancient Chinese explosive is hidden in one of the cufflinks. Shredder plans on using it to blow the Technodrome free of its lava bed. The investigation leads them to the house of Pietro Calzoni, who has the biggest collection of cufflinks around. The Turtles think that if anyone has the Cufflink of Cathay, it would be him. April and Irma, who are doing an investigation of their own, come up with the same idea as the Turtles. They all happen to end up at Pietro’s house at the same time. The Turtles tell April and Irma to wait outside while they go in to get the cufflinks. 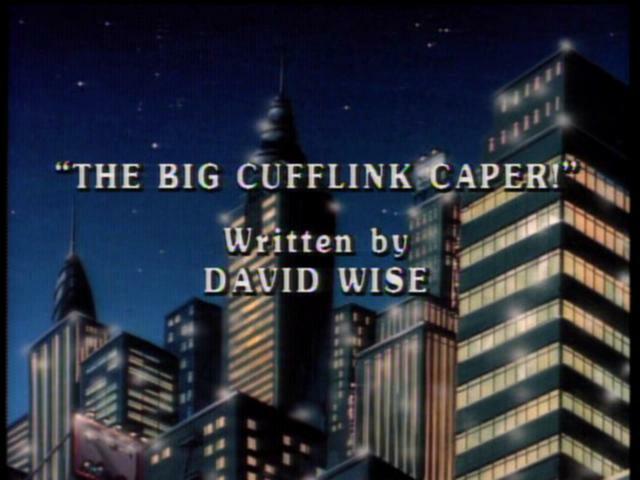 Just as the Turtles get their hands on the cufflinks, Big Louie and his gang show up, followed by Shredder. The TMNT grab the cufflinks and escape to a pizza parlor to figure out what they are going to do with the explosive jewelery. While the Turtles are making plans at the parlor, a bottle is thrown through the window. A note inside the bottle tells the Turtles to meet Shredder and Big Louie at the taffy factory if they ever want to see April and Irma again. When the Half-shelled heroes get there, Donatello throws one of the cufflinks into a vat of taffy. While Bebop and Rocksteady search for the cufflink, the Turtles fight off Shredder, Big Louie and his gang and rescue April and Irma. Bebop and Rocksteady finally find the cufflink and escape with Shredder to Dimension X. Krang does not think that the Turtles would be stupid enough to give them the cufflink with the explosive in it, so he has Shredder throw it out. Well, Krang was wrong! They did get the explosive one, but it being so old, it was not as powerful as they had expected. Krang and Shredder are disappointed once again.